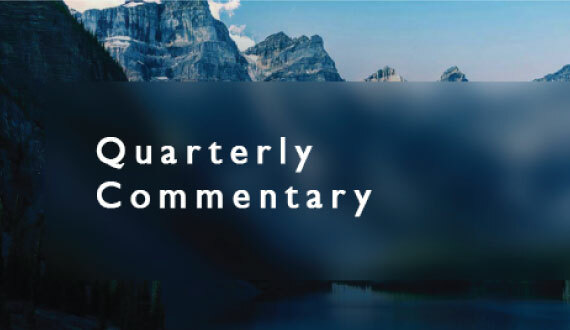 The stock market’s second quarter reminds us of the comparison to a swimming duck, placid on the surface and paddling furiously under the surface. The stock market was quiescent again during the quarter, though there were some substantial moves in the market’s components. We experienced one volatile day in mid-May when the market fell 1.8% after President Trump fired the FBI Director. Almost everything went down that day, but it only lasted one day. On many other days we experienced the tech sector producing nice gains while the energy sector and financial sector struggled. Biotechs and healthcare enjoyed their periods of outperformance. Financials regained their footing in the last two weeks of the quarter while investors rotated out of the high-flying tech sector, which gave back some of its gains. The Federal Reserve raised the Federal Funds rate by 25 basis points in June, as expected, expressing confidence in the economy’s momentum and predicting inflation will return to its 2.0% target. When longer term interest rates started to move higher in the last ten days of the quarter, the rotation from growth-oriented stocks into financials and industrials was a pleasant reward to those of us that had been patiently waiting for economic momentum to accelerate. Last quarter we discussed the strength in the soft economic indicators like small business optimism and consumer confidence. Most economists predicted the optimistic outlook of consumers and businesses would lead to stronger spending and GDP. As the figure above shows, we were disappointed by the actual results versus predictions. Washington political maneuvering was mostly to blame for the lack of follow through of business investment. Business owners may be delaying their capital investment decisions to see if tax reform and infrastructure spending programs are successful. Expectations for a rapid passing of favorable legislation transitioned into frustration with the usual Washington timetable of waiting until the last minute to solve a problem. One of the major shortfalls in the economic indicators, illustrated in the Economic Surprise Index, was the slower than predicted consumer spending levels. Retail sales were weaker than expected, even though job growth and earnings have steadily improved. Consumers may be saving more and spending less as a consequence of the Fed’s suppression of interest rates. With the Fed’s intention of gradually raising interest rates and shrinking their balance sheet, we may see a reversal of this anomaly. The economy did not react like most economists expected during the Fed’s zero interest rate policy and quantitative easing program, so the unwind may produce surprises too. The Fed only recently began speaking publicly about shrinking their $4 trillion balance sheet. Other central banks are also beginning to predict an end to the unusual monetary stimulus efforts. When ECB Chairman Draghi stated that deflation was no longer a threat, German bond yields surged. Global economic growth is more evenly distributed this year, reducing the need for extraordinary monetary policies. 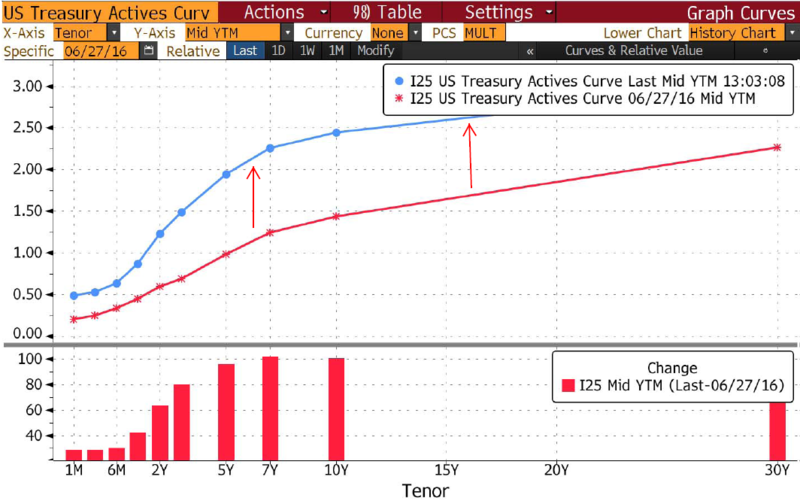 The weaker than anticipated growth in the U.S. economy and previous bond buying programs by foreign central banks led to a flatter interest rate yield curve as shown in Figure 2. Central banks, including the Fed, bought longer term bonds during their quantitative easing programs to bring interest rates lower to spur housing and business investment. Unfortunately, a flatter yield curve usually indicates weaker growth and can exacerbate deflationary concerns, which is the primary fear of central banks. Again, we believe the central banks have caused this problem themselves with their quantitative easing policies. In their efforts to induce stronger growth, they have pushed consumers and businesses to save more. Another unintended consequence of their efforts has been low market volatility. Through controlling long term interest rates, they have muffled the market’s ability to price risk. Long term interest rates have remained lower for much longer than needed. Stable long-term interest rates are buffering the market’s discounting mechanism, leading to low volatility and investors’ overweighting in growth stocks and bond proxies such as utilities and consumer staples. The Yellen Fed’s attempt to manage the volatility of interest rates, reminiscent of the Greenspan Fed’s predictable increases in the middle of the last decade, leads to increased leverage and misallocation of capital. Other central banks are copying the Fed’s playbook. We must be vigilant for economic sectors where excessive risk-taking is occurring. Three years ago, too much investment was flowing into the energy sector. Where is the extra leverage flowing now? The graph above shows a comparison of the Russell 1000 Growth Index to the Russell 1000 Value Index. The growth index comprises companies with higher price to book ratios and higher predicted growth rates than average. The value index includes companies trading at lower valuation ratios. In the first half of 2017, the growth index outperformed the value index by 10%. 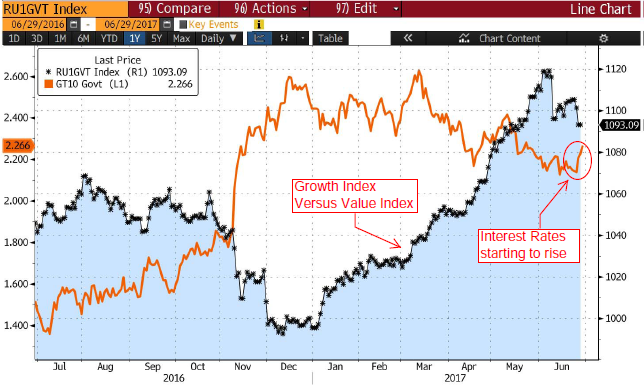 In June, when central bankers began discussing the need to reduce their bond purchases and interest rates started to rise, the disparity between growth and value stocks started to reverse. Maybe this indicates where the excess risk-taking is transpiring. As the Fed starts to shrink their balance sheet and foreign central banks follow suit, interest rates should gravitate towards normal levels as markets determine what is appropriate. Historically, during periods of moderate economic growth and inflation, the ten year Treasury yield would exceed inflation by 2%-3%. Economists expect inflation to continue running slightly below 2%, so a ten year yield of 4% is appropriate. Should Congress pass tax reform and/or an infrastructure package, higher interest rates would be essential. Higher interest rates will lead to more efficient allocation of capital and a more efficient economy. Higher interest rates will put pressure on Congress to reduce the deficit and spend tax revenues more effectively. And best of all, higher interest rates will benefit the banking system, boosting the profitability of banks and increasing their lending capacity. Price controls never work. The Fed has been implementing price controls on money. How much of the “new normal” slower economic growth rate expounded by some economists is a result of Fed price controls on money? We expect there will be some doctoral theses written on the subject in the years to come. Our large cap stock strategy increased by 3.78% in the second quarter and 8.96% in the first half compared to the S&P 500 Index gain of 3.09% in the quarter and 9.33% in the first half. The dollar weakened against the major foreign currencies during the second quarter, helping US based manufacturers compete globally. The industrial components were strong with Caterpillar, Boeing, 3M and United Technologies showing nice gains. The strongest performing portfolio position was McDonald’s, rising almost 19%. With many restaurant chains reporting weak results, McDonald’s stands out with their better than anticipated growth in revenues and earnings. They adapted quickly to the changing eating tastes of the global consumer. The weakest position for the quarter was IBM, falling 10.86%. They are transitioning to more cloud-based business, but the declines in other sectors of their business are still pulling revenues lower. The Dow Jones Industrials technology components were not as strong as some of the NASDAQ high flyers; Apple was flat for the quarter, Cisco and Intel declined, and Microsoft gained 5%. We commented last quarter about analysts’ prediction of higher revenues and earnings this year. First quarter earnings saw a nice increase of over 13% versus the previous year. Second quarter earnings are projected to grow too. If we see any kind of positive move from Washington on taxes and infrastructure, the second half of the year should continue the trend of higher revenues and earnings. The firm’s small company stock portfolio rose 3.49% in the second quarter and 6.05% for the first six months compared to the Russell 2000 Index, which rose 2.46% during the quarter and 4.99% in the first half. As we showed in the Russell index comparison previously, the growth style has outperformed the value style significantly in the first half of 2017, but our portfolio of value-oriented companies has kept pace. Similar to the large company stocks, one of our industrial companies led the way as FreightCar America gained 39%. Rent-A-Center rebounded 33% after making management changes and an activist investor took a sizeable position. Arcbest was the weakest portfolio position, falling 20% after reporting weaker than expected quarterly results. The transportation sector has shown strength recently, so we expect Arcbest to recover. We did not sell any portfolio positions during the quarter. We added Sandridge Energy, an oil and gas exploration and production company, to the portfolio. They completed their restructuring last year and have no debt, plenty of liquidity and growth prospects. A research summary is included for clients invested in the strategy. : The high yield asset class strategy rose 3.72% in the second quarter of 2017 and 4.79% in the first half compared to 2.16% and 4.92% respective gains for the Merrill High Yield Index and 2.98% and 8.76% gains in the Merrill Convertibles Index. The strong performance of the technology and biotech sectors boosted the convertibles index. The high yield market is trading at strong valuations because defaults are trending lower. Capital markets are receptive to refinancing lower credit quality companies as investors search for yield in the low interest rate environment. Our strongest performing position during the quarter was the convertible preferred issued by Iridium Communications. The company benefitted from the successful launch of two sets of satellites by SpaceX. The constellation of 70 new satellites should be completed in the next twelve months. Global Eagle convertible bonds rebounded by 28% after falling last quarter when they fired their CEO and CFO. They are on track to become current on their SEC filings this quarter. Our A. Schulmann convertible preferred fell 6% in the second quarter, representing our weakest position. They reported earnings in-line with expectations and reiterated guidance. The drop is primarily due to illiquidity. We added one new position to the strategy, a convertible bond issued by Aceto Corp., who produces pharmaceutical chemicals and ingredients. The remainder of our Cenveo Corp. bonds matured in May and our Blucora bonds were called in early June. Given the strength in the high yield sector we are cautious on our outlook for reinvestment of proceeds. Our MLP asset class strategy fell 8.96% for the quarter resulting in a decline of 4.99% for the first half. The Alerian MLP Index fell 6.35% in the quarter and 2.66% for the first half. Besides the impact of lower oil prices, our strategy was impacted by two specific holdings. NGL Energy Partners has been predicting an increase in their payout this year, but after a warm winter reduced their propane sales, they delayed boosting their distribution for a few more quarters. The delay hurt management’s credibility and upset investors leading to a 36% decline in their unit value for the quarter. Another holding, Rice Midstream, fell 20% for the quarter after their parent agreed to be acquired by EQT. Rice Midstream was expected to purchase additional assets from its parent over the next few years, leading to over 20% annual growth in their distributions. However, after the sale of their parent was announced, EQT stated that all dropdown assets would be sold to EQT’s MLP subsidiary, so Rice Midstream’s growth outlook was cut in half. Currently, we are experiencing an oil price decline caused in part by growing US supply. Oil prices ended higher for the seventh straight day to end the quarter bringing WTI August futures back above $45 a barrel. US rig counts also decreased for the first time in 24 weeks. Despite the continuation of an OPEC cut, prices have dropped in the past month. Oil in storage remains high though declining and production has resumed in Libya and Nigeria shifting sentiment easily into negative territory. One way to gauge sentiment is by looking at the short positioning in futures contracts. Prices are more influenced now by investor trading rather than by actual consumers and producers of the products. Oil price declines are aided by increases in short positioning and vice versa. The exhibit below shows that short positioning has been elevated in the past two years compared to the prior five years. Since the energy sector meltdown in 2014-2015, MLP valuations have closely tracked oil prices. In our opinion, the recent correlation has been excessive. MLPs generate revenues from the transportation, storage and processing of energy products. Domestic production has increased this year and the rig count has more than doubled from last year’s low, suggesting further production gains. 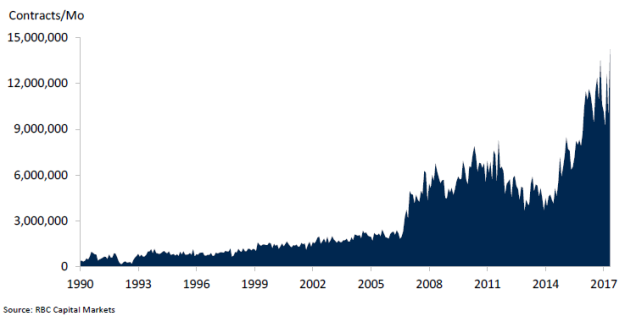 Higher volumes mean higher revenues for MLPs. Most MLPs have reduced their debt ratios and are operating in a more conservative fashion. We believe the sector dividend yield of 7% is very attractive compared to other income producing sectors. As seen in the graphs above, traders are pushing the oil markets around, and MLPs with them. We believe the sector represents good value. The firm’s taxable bond portfolio rose 0.48% in the second quarter and 0.82% in the first half compared to 0.95% gain in the quarter for the Citigroup 1-10 Year Government/Corporate Index and 1.70% increase in the first half. The firm’s tax exempt bond portfolio rose 0.28% in the second quarter and 1.37% in the first half compared to 1.10% and 2.64% respectively for the Merrill 3-7 Year Insured Muni Index. The yield curve flattened during the quarter as short term interest rates rose with the Federal Reserve increase in the Fed Funds rate, while longer term interest rates fell slightly. The decline in longer term rates boosted performance of the indices relative to our positioning, which is still defensive. With the Fed preparing to shrink the size of their bond portfolio and foreign central banks reducing their stimulus efforts, we expect interest rates to move higher. The ten year treasury yield has increased 0.25% over the last ten trading days. After the stock market experienced a frenzied rally in the fourth quarter, the first quarter was relatively boring. High expectations for rapid changes in Washington transitioned to doubts about the Trump administration being able to accomplish its primary goals. We are now seeing how the sausage is made. Not too pretty, but maybe it will taste good in the end. The political show has provided many distractions, as good as most reality television shows. What is surprising to us is how calm the market has behaved since the holidays. The average daily change in the Dow Industrials during the first quarter was the lowest since 1965. The VIX (Volatility Index) posted its second lowest quarterly average on record (Wall Street Journal). The graph below shows the VIX history over the last two years. Last year at this time, the sky was falling; now you can hear crickets. Last month the Dow Industrials fell for eight straight days, though it only lost 1.9% and recovered within two days. For the quarter, the S&P 500 Index rose 6.06%, with the tech sector leading the way. Last quarter’s winners took a breather this quarter, with the financial sector generating weak returns. Short term interest rates rose in coordination with the Fed’s quarter point boost of the Fed Funds rate in March, while long term interest rates fell slightly. The anticipated acceleration of economic growth has not occurred yet, taking some of the reflation pressure off rising interest rates. Now the big question the markets face is whether stronger growth will happen this year. Most economists based their predictions of better domestic economic activity on the Trump administration’s proposed tax and regulatory reforms. After the failure of House Republicans to repeal Obamacare, the probability of other reforms has fallen. Regulatory reform is being pushed, and it will help the energy sector and the financial sector, but those changes can be temporary depending on who controls the executive branch. Much depends on the ability of the administration to work with Congress to reform our convoluted tax code and increase the incentives for higher productivity in the private sector. Similar to last quarter, we are relatively optimistic that the economy will grow stronger and earnings will increase this year. A few reasons we have a positive outlook include: rising consumer confidence, small business optimism, growing manufacturing, and improving global economies. Europe and China are showing signs of stronger growth. The Trump administration has toned down some of their trade barrier rhetoric, reducing the possibility of a trade war, and even the Mexican stock market has performed well this year. 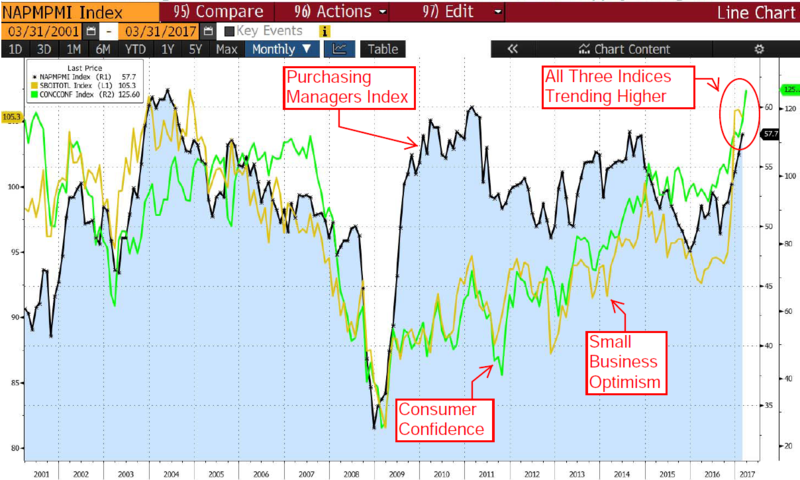 The graph below shows the correlation of the jump in consumer confidence, small business confidence, and the purchasing managers’ survey. Right now, most estimates for first quarter GDP growth are close to 2%, similar to last year. A few areas of weakness include auto sales, consumer discretionary spending, and anemic utility output during a mild winter. The consumer confidence and small business optimism indices suggest that spending will pick up. Job growth is steady and earnings are improving so an optimistic outlook should translate into more consumption. The rise in the global purchasing managers survey suggests that the global economy is recovering from the strong dollar shock of 2014-2015. Oil prices stabilized in the $45-$55 range. 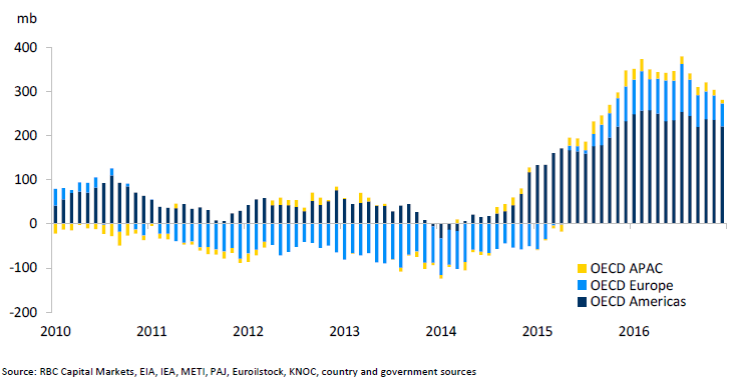 Industrial metals prices rebounded over the last twelve months and currency volatility has subsided. Domestic earnings estimates show a nice increase projected for this year. The energy sector will become a contributor again after suffering from falling oil prices in 2014-2015. The financial sector should see a boost from higher interest rates and larger loan portfolios. 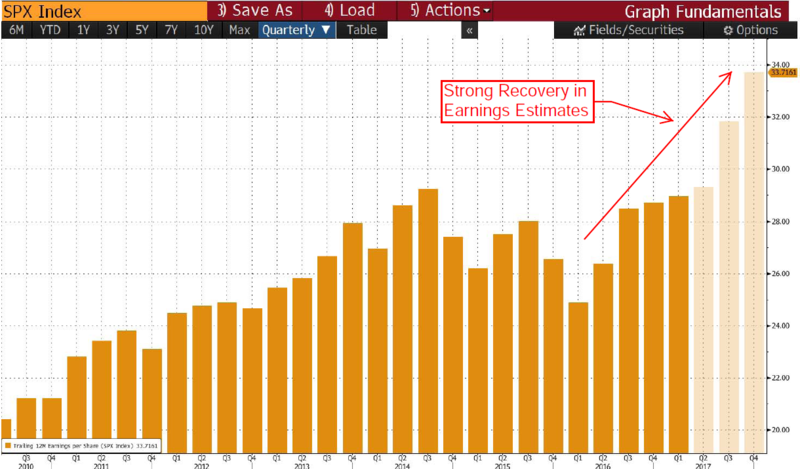 The graph below shows how S&P 500 company earnings fell for six straight quarters through early last year, and are now growing again. Analysts are very optimist about higher earnings in the second half of the year. Some of the jump in projected earnings is based on the expectation of lower corporate income tax rates. Should Congress fail to agree on a tax reform package, we could see earnings estimates decline and higher stock price volatility. Our large cap stock strategy increased by 4.99% in the first quarter compared to the S&P 500 Index gain of 6.06%. The technology sector was the strongest performer in the first quarter, boosting the S&P versus the Dow. Apple, the company with the heaviest weighting in the S&P index but also a Dow component, was up 24% in the first quarter, leading the portfolio. Boeing and Visa gained 14% in the quarter. Chevron and ExxonMobil were the weakest performers, declining 8%. Oil prices fell from their recent highs and investors worried that high inventories and increased domestic production would weigh on future prices. The companies in the Dow Industrials receive over 40% of their revenues from overseas. A growing global economy will boost their international income. The firm’s small company stock portfolio rose 2.47% in the first quarter compared to the Russell 2000 Index, which also rose 2.47%. The growth oriented companies in the Russell Indices substantially outperformed the value oriented companies, so we were pleased to keep pace. The strongest performing holding in the quarter was Banc of California, who rose 20%, after replacing their CEO and selling their mortgage origination subsidiary. Rent-A-Center was the weakest performer, declining 20%, after reporting weak earnings and replacing their CEO and CFO who were responsible for a terrible transition to a new point of sale system. We sold three positions during the quarter that reached our valuation targets: Masonite International (a door producer), Mercantile Bank Corp., and Olin Corp. (a chemical company). We also received our first liquidation payment from Hercules Offshore. We added one new position to the strategy, Triumph Group, an aircraft parts manufacturing company. A research summary is included for clients invested in the strategy. The high yield asset class strategy rose 1.03% in the first quarter of 2017 compared to a 2.71% gain for the Merrill High Yield Index and a 5.62% rise in the Merrill Convertibles Index. The strong performance of the technology sector boosted the convertibles index. The best performing position in the asset class strategy for the quarter was the Sunpower convertible bond that rose 14%. The weakest performer was the convertible bond issued by Global Entertainment that we purchased last quarter. It fell 36% after firing the CEO and CFO and delaying the filing of their 10-K. They had reported some material weaknesses in the filing of their 2015 10-K and we suspect those weaknesses had not been addressed. We purchased the bond after they announced an extension of their contract to provide internet service to Southwest Airlines. The remainder of our Cenveo 11.50% bonds were called during the quarter. We are patiently waiting for opportunities to reinvest proceeds in the high yield sector. Our MLP asset class strategy gained 4.36% for the quarter versus 3.95% for the Alerian MLP Index. MLPs started the year strong in January as they often do. Our portfolios have changed little in the last two months despite the decline in commodity prices. Another relatively warm winter hurt natural gas prices and high inventories of oil in the US sent the price per barrel back below $50. Domestic production is still expected to grow in the next two years. Rig counts have increased almost every week since the first OPEC announcement and many producers have increased their hedges relative to the past. The rebalancing is working as we expected, where cheaper US production will replace more expensive sources globally. The chart below shows just how much of a surplus was accumulated by developed nations. We are seeing a clear decline in inventories and think the recent oil price declines are more noise than something permanent. The midstream sector valuations remain cheap relative to their own history with yields on average over 7%. Where other sectors and even other energy subsectors are trading above their historical average or on much more optimism, investors have not circled back around to MLPs yet, leaving some attractive value for us. The firm’s taxable bond portfolio rose 0.34% in the quarter compared to 0.75% gain for the Citigroup 1-10 Year Government/Corporate Index. The firm’s tax exempt bond portfolio rose 0.79% in the first quarter compared to 1.53% for the Merrill 3-7 Year Insured Muni Index. The yield curve flattened during the quarter as short term interest rates rose with the Federal Reserve increase in the Fed Funds rate, while longer term interest rates fell slightly. The decline in longer term rates boosted performance of the indices relative to our positioning, which is still defensive. Our portfolios are structured for a rising interest rate environment. Should the expected acceleration of the economy fail to materialize, our bond portfolios will underperform. Fiscal stimulus, either through tax reform or infrastructure spending, ought to put upward pressure on rates. We are optimistic that the first quarter was the pause that refreshes. The sectors that led the rally in the fourth quarter took a breather. We expect consumer and small business optimism will generate stronger spending in the near future. Spring is the season of renewal and hope, right? Investors had reason to celebrate this holiday season as the stock market indices set new record highs. The domestic economy is back on the road to normal and the business sector is pushing on the accelerator. We see many reasons to be optimistic, even after the strong rally in the fourth quarter, including surging consumer confidence, increasing capital investment plans from the corporate sector, fiscal stimulus from Washington, a recovering oil patch, and even a strong dollar. Prior to the fourth quarter a strong dollar was worrisome to the markets as it makes selling abroad more difficult for domestic manufacturers. But now the economic policies in play since the credit crisis are being upended. Instead of relying on low interest rates and a weak currency to spur economic growth (at the expense of global competitors that have not pilloried their currencies), U.S. policymakers are going to focus on improving the conditions to generate domestic demand and growth. The U.S. economy is still the largest in the world by far. If we become the engine of global growth again, then the recent currency devaluations can stop, interest rates can normalize, and capital can be allocated efficiently. One year ago, the global financial system was in the midst of another potential meltdown as the major central banks flailed helplessly, trying to boost demand by lowering interest rates to negative levels. They quickly learned that negative interest rates would make it impossible for banks to operate profitably. Without a strong functioning banking system, the global economic engine would freeze and blow a gasket, because credit is the lubricant that keeps the engine performing. We think the global central bankers realized this possibility last February and quickly informed the major private sector banks that they saw the error of their ways. The financial markets bottomed in February and started a nice recovery that gained momentum after the contentious U.S. elections. We hit a speed bump in June when the United Kingdom voted to leave the European Union, but that was another sign that policies were going to change. Markets quickly recovered from the Brexit detour with investors embracing the rebellion against conventional wisdom. 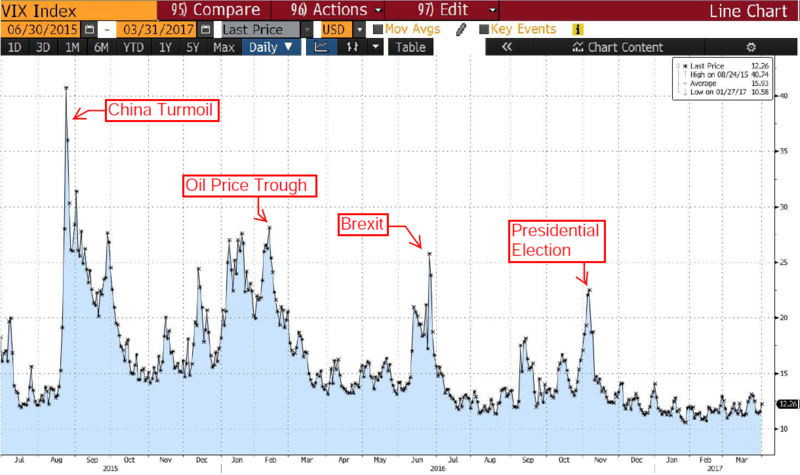 Risk appetite waned going into the U.S. elections, but once the surprising results were confirmed, the markets raced ahead, gaining another 5% in the fourth quarter. What started out as a year filled with anxiety and fear ended as a one filled with confidence and optimism for investors. There are still many skeptics regarding the new administration. We will attempt to avoid the politics and focus on the economics of the new administration’s policies. There are two primary objectives of the new economic team: lower taxes and reducing the regulatory burden. The proposals include lower corporate taxes and lower individual income taxes. The U.S. tax code has grown so complex over the last fifty years that it is impossible to not violate some of its requirements. It takes tremendous amounts of time to attempt to comply because of the complexity. And each additional regulation adds additional uncertainty and burden on the productive efforts of the economy. The best tax is a simple one that is applied uniformly across the economy. Tax reform is the best way to improve private sector productive capacity. Instead of spending time trying to figure out ways to avoid paying taxes through some loophole, business owners can focus on investing in new equipment to produce a product or service at lower costs. Tax reform should include eliminating or limiting many deductions. It is important to broaden the tax base while lowering rates in order to maintain government revenues and avoid boosting the fiscal deficit. As we have said many times, incentives matter. If the government allows private citizens to keep more of what they earn, they will spend it much more efficiently than a government entity that has too many constituencies with which to contend. Tax reform occurred in the early 1960s and the early 1980s, leading to strong subsequent growth in the economy. A vehicle can go much faster when it does not have to carry lots of baggage. The other objective is to reduce the regulatory burden on the private sector. This especially applies to the financial sector. The Dodd Frank financial legislation that was passed after the credit crisis resulted in hundreds of new rules from thousands of pages of regulations. Instead of hiring lending officers, banks have been hiring compliance officers. Bank regulation has become increasingly complex. If you have applied for a loan or a mortgage in the last few years, you know how much financial information is required to complete the application. Even though interest rates are extremely low by historical standards, loan growth has not responded to the low rates. Business owners are reluctant to borrow in a slow growth environment where interest rates cannot guide the capital asset pricing model because they are artificially depressed. Consumers are reluctant to borrow because of the financial data burden and the restrictions on the flow of credit to any but the highest quality borrower. It would be much more economically beneficial to raise the amount of capital a bank should hold against its asset base and lower the restrictions on how they lend the money. The market is anticipating this kind of reform, because the banking sector stocks led this rally, gaining over 20% on average. Regulatory reform for domestic energy production is another goal. The U.S. has the best technology to produce oil and natural gas of any country in the world. We should use our competitive advantage to produce low cost energy that would give our manufacturing base the ability to compete against low cost labor-sourced production. Health care regulation is another area targeted for reform. Once again, thousands of pages of legislation and regulations are making it more difficult for consumers to receive good care at low cost. The consolidation of the health insurers is a good indication that they are getting bigger in order to negotiate with the government, not for competitive reasons. Competition generates better products at lower prices. Once the Fed indicated they were going to stop purchasing bonds, the dollar surged in 2014. The stock market held up until turmoil in China caused major volatility in the summer of 2015. China had informally pegged their currency against the dollar, but the dollar’s major appreciation in 2014 made their goods less competitive and Chinese economic growth slowed. Slower Chinese growth and a strong dollar weakened demand for commodities hurting the global growth outlook. The Fed raised interest rates once in December 2015, but they were wary of spooking the financial markets again; exacerbating the dollar’s strength by raising rates too rapidly. The domestic economy gained strength in the third quarter, putting upward pressure on interest rates, and after the election rates shot higher, commensurate with a strong dollar as shown in the next graph. The graph shows the yield curve immediately after the Brexit vote versus the current yield curve. Short term yields are up slightly while longer term yields are almost 1% higher. The yield curve has steepened substantially which indicates stronger growth expectations with more potential for inflation. Higher interest rates and a stronger dollar suggest that capital flows are positive into the U.S. A strong dollar makes it more difficult for our exporters, but it also lowers the risk of inflation. In our experience, the strong dollar of the 1980s and 1990s was beneficial to domestic growth and inflation. Once we moved away from strong dollar policies, domestic economic growth became much more uneven and financial engineering became more important. Our final reason for optimism, though we could find more, is the jump in consumer confidence. The graph below shows the measure of consumer confidence since 2000. It recently hit a fifteen year high. When you combine the consumer confidence gain with the stronger dollar, rising stock market, improved plans for business spending, and steeper yield curve, it looks to us like the economy’s animal spirits are reviving. Many analysts believe the economy and the markets are in the late stages of this recovery. We suggest that a resurgence of growth in the United States, the largest economy in the world, will lead to a boost in global growth. The shake up in economic policies could lead to a prolonged period of stronger growth and higher corporate earnings. Maybe we are being too optimistic, but that is what the market is telling us now. Our large cap stock strategy surged in the fourth quarter by 8.43% compared to the S&P 500 Index gain of 3.81%. For all of 2016, the Blue Chips rose 16.01% against a 11.93% gain in the S&P 500. The asset class was led by Goldman Sachs, up 49%, and JP Morgan Chase, up 30%. Visa was the weakest position in the portfolio, declining 5.5%, as investors rotated from higher valued, consistent growth stocks to companies that will benefit from more broad based economic growth. Surprisingly, some of the technology and pharmaceutical stocks were the weakest during the fourth quarter. Investors had expected them to benefit from the continuation of current government policies, so the surprise election outcome made these stocks a source of cash for rotation into financial stocks and industrial stocks. We agree that there is risk in the market trading at higher multiples of earnings should new policies disappoint, but current projections are for a return to earnings growth this year after a year and a half of weaker earnings. The energy sector should see stronger earnings in 2017 after being a drag for most of 2015 and 2016. The firm’s small company stock portfolio took off in the fourth quarter, rising 12.63%, compared to the Russell 2000 Index, which rose 8.83%. For all of 2016, our small caps gained 31.18% against the Russell 2000’s 21.31% jump. This was the first year in a while that our value style outperformed the growth style. Just when most prognosticators gave up on active management and recommended passive, index product investing, the tables turned. The portfolio was led by Unisys, which rose 53.5% after reporting better than expected earnings. Arcbest, a trucking and logistics company, rose 46%, while McDermott International, an offshore oilfield services company gained 47%. The weakest holdings included Lannett, a generic drug company, which fell 17%, and Rent-a-Center, which declined 10%. We booked gains on three positions. Apollo Education reached a price close enough to the agreed valuation that they agreed to be acquired by Apollo Group in a going private transaction. Mercantile Bank Corporation traded to our target valuation of 20% of assets, and Spartan Motors almost doubled from our original cost. We added one new position to the strategy during the fourth quarter, NMI Holdings, a private mortgage insurance company. A research summary for the company is included for clients in the strategy. The high yield asset class strategy rose 6.31% in the final quarter of 2016 compared to a 1.85% gain for the Merrill High Yield Index and a 2.61% rise in the Merrill Convertibles Index. For the full year, our strategy rose 26.22% compared to 17.34% for the Merrill High Yield Index and 11.87% for the Merrill Convertibles Index. Even though interest rates surged higher during the quarter, they were offset by expectations of higher earnings growth and higher stock prices. Many of the stocks underlying our convertible bonds gained double digits in the quarter. The best performing position was our AK Steel convertible bond. It rose 38% in the quarter and we sold the position for a 67% realized gain. We added two new positions. The first is A. Schulmann & Co. convertible preferred stock that yields over 6%. A. Schulmann is a chemical company that deals in plastics compounds and resins. The second was Global Eagle Entertainment convertible bonds that yield 4.2% to a put date in 2022. Global Eagle is a provider of internet services for the aviation industry. They recently signed a contract extension with Southwest Airlines. We received warrants to purchase the new equity that will be issued by Horsehead Holdings in exchange for our convertible bond position. We expect some recovery with the warrants since the company was grossly undervalued during the restructuring. 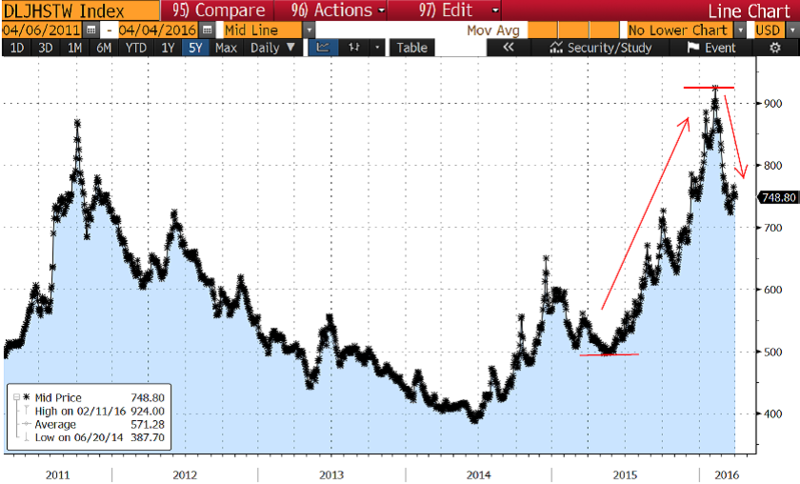 The high yield sector holds risk from higher interest rates and tighter financial conditions. As long as the yield curve is steep and stronger economic growth is anticipated, the sector should perform well. Growth leads to higher revenues and the ability to pay down debt. Our MLP asset class strategy gained 3.99% for the quarter versus 2.04% for the Alerian MLP Index. For all of 2016, our MLPs rose 29.90% against a gain of 18.31% for the index. The last two months of the year helped MLPs finish off a great year. While oil is still only at $50 a barrel, US energy production has held up and looks poised to return to growth in the upcoming years. OPEC’s market share strategy does not look like it will impair long term US production. It likely only hurt its own high cost producers. Domestic regulations are expected to be eased for E&P and midstream companies as well. Just as important, MLPs showed that they were able to get back on track themselves. Distributions were cut, new alliances were sought, and other strategies were pursued to stabilize balance sheets and incomes. The underlying cashflows and businesses for the majority of MLPs allowed many to maintain their distributions, increase their coverage ratio, lower their debt, and survive. Even though interest rates have risen substantially, MLPs yield nearly 5% more than 10 year Treasuries. The fundamental backdrop and relative valuation for MLPs looks far more positive as we enter 2017. The firm’s taxable bond portfolio fell 0.16% in the quarter compared to -2.45% for the Citigroup 1-10 Year Government/Corporate Index. The firm’s tax exempt bond portfolio declined 1.30% in the fourth quarter compared to -1.96% for the Merrill 3-7 Year Insured Muni Index. For the full year, our taxable bonds gained 3.17% compared to 1.78% for the Citigroup Index. The tax exempt bonds rose 0.27% while the Merrill index gained 0.53% for all of 2016. We have been positioned for rising interest rates in our bond portfolios for a long time. We are finally being rewarded for being cautious. The Fed is projecting three interest rate increases in the next year, and the market agrees with them. That would put the Federal Funds rate at 1.50% by the end of 2017. We will almost be back to normal. As mentioned above, we think the strong dollar will offset some of the inflationary pressures of stronger growth. We are more optimistic regarding the economy than we have been since the credit crisis. Monetary policy saved the financial system in early 2009, but the experiments implemented since then have had diminishing impact. Forcing short term interest rates into negative territory was a poor decision and fortunately was quickly rescinded. It is now time for fiscal policy to take the driver’s seat and keep us travelling down the road to economic opportunity and wealth creation. We look forward to the trip. Today is Opening Day for Major League Baseball, America’s pastime. We have some pretty strong baseball fans in our office, so today is a great day. It also means that temperatures are warming, days are longer, and that we can spend more time outside, all positive. The big question is: will springtime lead to positive outcomes in the financial markets after a miserable winter where many investors worried that we were entering another financial crisis? We are breathing easier than late January to mid-February, when markets were panic-stricken. We find it unsettling that the financial markets could cause another crisis without an underlying economic reason. At their lowest point in February, the broad stock market indices were down 10% for 2016. Many higher risk sectors were down double that. Credit conditions were tightening and bank stocks were under terrible selling pressure. We think most of the crisis atmosphere came from mistaken central bank policies that were undermining the banking system, especially in Europe. The European Central Bank instituted a negative interest rate policy in late 2015. The Bank of Japan followed suit in late January. The subsequent two weeks exhibited fear in the financial markets as investors questioned the ability of money center banks to generate profits in a negative interest rate environment. Janet Yellen, the chair of the Federal Reserve, in her semiannual testimony before Congress discussed the Fed’s examination of potentially using negative interest rates as a stimulus measure in the U.S. Our money center banks dropped in value by 10%-20% within a week of her testimony. We think central bankers got the message and are now looking for ways to boost banks’ profitability through other measures that offset the impact of negative interest rates. Banks are the grease that keeps the economic engine humming. With banks hurting, the economic engine begins to lose power and eventually needs an overhaul. Negative interest rates threatened banks’ ability to provide credit to the global economy. We should point out that one of this generation’s most outstanding bankers, JP Morgan’s CEO Jamie Dimon, stepped up and bought 500,000 shares of his company’s stock at the low price for the year on February 11th. If only our central bankers were as level-headed. Economic growth was positive in the fourth quarter of 2015 and should be similar in the first quarter of 2016. 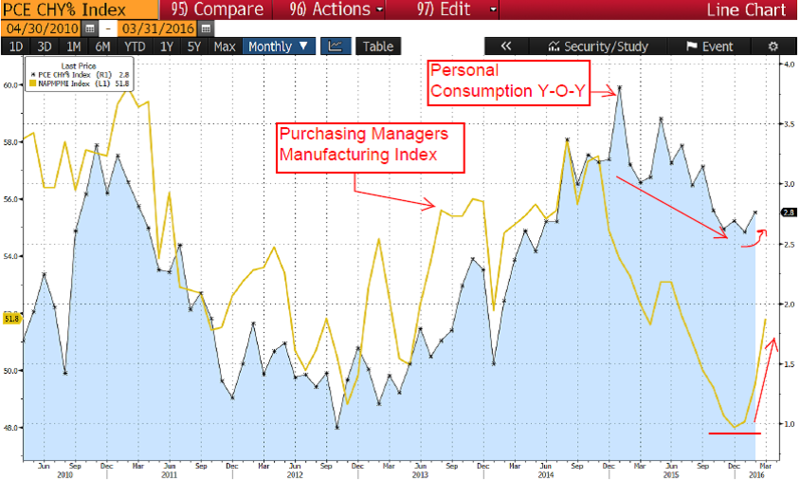 The domestic consumer is on sound footing and job growth has been consistent. Wage increases have been mediocre during the economic recovery from the credit crisis, but inflation has been very tame, so consumers’ purchasing power is rising. Consumers have been conservative with their spending patterns since the middle of last year. This may be a result of the market turmoil that started last summer with the stock market meltdown in China. As volatility in our markets increased, consumers saved more and spent less, even as gasoline prices fell, boosting their disposable income. The confluence of weak stock markets, a strong dollar, fears of the Federal Reserve raising interest rates too quickly, and ceaseless terrorist attacks hurt consumer confidence. The graph below shows how consumer spending weakened during the second half of last year. The graph also shows the softness in our manufacturing sector. The strong dollar, weak emerging markets, and contracting energy sector caused the manufacturing sector to deteriorate in the second half of last year. We are starting to see a turnaround in manufacturing as the factors that hurt domestic production last year are reversing. The dollar is weakening, which helps emerging markets and boosts commodity prices. China appears to be stabilizing its economy. The Chinese currency is under less pressure due to the weaker dollar. The domestic energy sector is still hurting, but the marginal change from current activity will not be as dramatic as the declines over the last twelve months. Recent indicators for the manufacturing sector are starting to show improvement, with the ISM index rising above 50 for the first time in seven months. Stabilization in manufacturing will help put the economy back on a 2%-3% growth track. We believe the recent recovery in the stock markets and drop in market volatility will help support consumer confidence. Spending should improve as a result. As we pointed out last quarter, when the Fed raised short term interest rates in December and predicted four more increases this year, market volatility increased because financial conditions tightened much more than the one quarter percent increase in interest rates. The strong dollar and higher credit spreads resulted in more investors seeking safety and selling risk assets. The impact on the high yield sector was especially dramatic, with spreads on high yield bonds widening by over 400 basis points. (More on this subject in the high yield asset class review below.) The easy money conditions promoted by global central banks over the last seven years led to a surge of new investor funds into lower credit quality bonds. Now that the Fed is planning to stop the easy money, companies dependent on the junk bond sector for funding will face higher interest costs. A twenty-five basis point increase in short term interest rates by the Fed led to 4.0% higher interest costs for weak borrowers. We suspect that was an unintended consequence of the Fed’s move. Much of the easy money found its way to the energy sector during the domestic drilling boom. Usually overindulgence leads to a hangover and we are still suffering the after-effects of the Fed’s strong punch that was served prior to 2014. Now that the Fed wants to wind down the party, the energy sector is feeling the strongest impact. Credit conditions in the energy sector are much tighter than for most other sectors. Limited credit will lead to more bankruptcies in the exploration and production and oil field service sector this year. Domestic oil and gas production started to decline last fall. Tighter credit will accelerate the decline since exploration companies will find it much harder to raise capital for drilling. This is one reason that we are optimistic the energy prices will rebound in the second half of this year as the oil market finds balance. Another reason to expect energy prices to improve in the second half of this year is the surging demand for gasoline. Auto manufacturers are having trouble selling sedans, but they cannot keep enough pickups and SUVs in inventory. Demand for gasoline increased during the recent winter months, which almost never happens. The same is happening globally. Low prices spur demand for cheap energy. Surging demand and falling non-OPEC supply suggest the crude oil market should improve. Will it improve soon enough to rescue the over-indebted exploration and production companies in the U.S.? After the financial market’s reaction to the Fed’s interest rate increase in December and the poor sentiment regarding future increases that was exhibited during the first seven weeks of 2016, we think the Fed will take a gradual approach to raising rates for the remainder of 2016. There may be times when conditions allow for an increase without threatening market turmoil, but the Fed realizes that higher domestic rates can strengthen the dollar more than they desire and that would hurt global growth, starting a feedback loop to the domestic manufacturing sector. 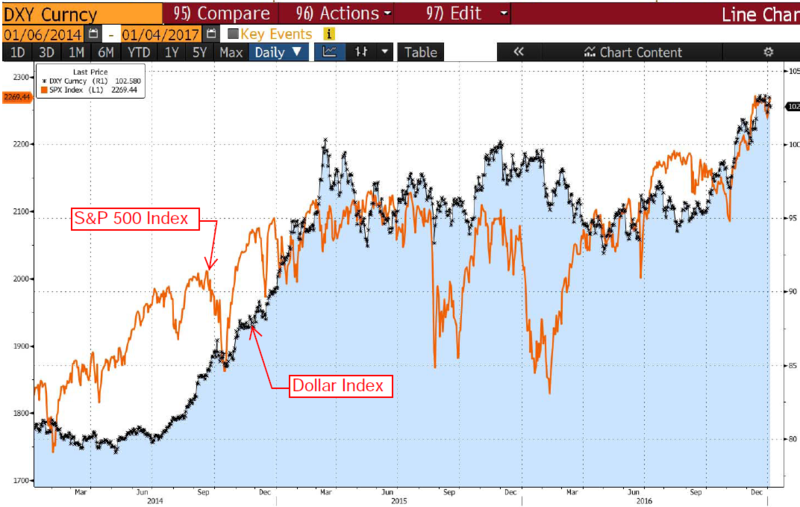 The graph below shows how the dollar has declined since pressure built on the Fed to go slow, and how commodity prices responded positively to prospects for a weaker dollar. 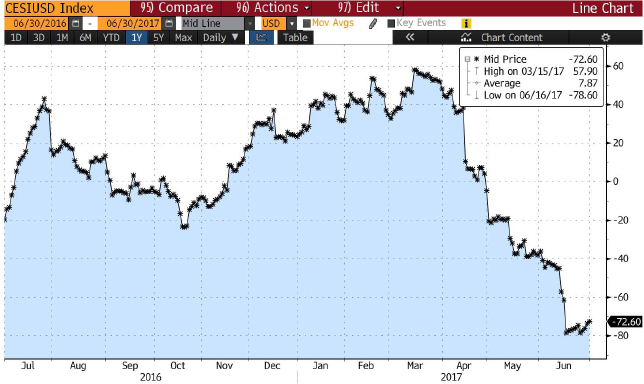 The commodity price index has increased almost 10% while the dollar index has declined approximately 6% from its December peak. 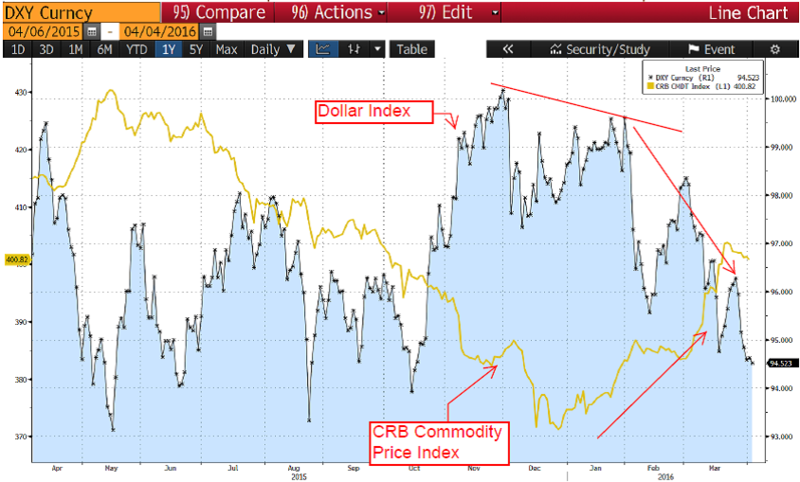 The commodity price index had fallen over 25% from mid-2014 to the end of 2015 as the strong dollar sapped demand. The strong dollar also hurt the growth prospects of emerging markets. Since developed markets economic growth was still trying to recover from the credit crisis, when emerging markets slowed, the global economy faced bleak prospects. We think the Fed now understands the big picture and will move cautiously this year. The only thing that might force them to move aggressively is higher inflation. Our large cap stocks gained 2.22% in the first quarter, while the S&P 500 rose 1.34%. At the depths of the February decline, both indices were down over 10%, so we saw a strong rebound. Year over year, earnings for the Dow Industrials are estimated to fall slightly over 3%. No wonder the market has had a difficult time over the last six months. Energy sector losses are bringing down earnings for the overall market, but industrials and materials companies are expected to report weak profit growth too. We expect the weaker dollar to help support the manufacturing sector, improving prospects for exports. Verizon Communications was the best performing position for the portfolio during the first quarter, rising over 18%. Investors rewarded their high dividend yield and moderate growth prospects in this slow growth and low interest rate environment. The second strongest performing stock was Caterpillar, gaining almost 14%, as investors bet the weaker dollar will help emerging markets growth. Goldman Sachs was the weakest performing position, falling 12.5% for the quarter. Market volatility did not lead to the surge in trading volumes that were hoped for, and the weak stock market and tighter credit conditions restricted the volume of new issues. American Express was the second weakest position, falling more than 11%, as their deal with Costco expires and they will have to find new opportunities to boost earnings growth. The Blue Chips offer a dividend yield over 2.5%, exceeding ten year Treasuries by more than three quarters of one percent. Our small company stock strategy rose 4.27% in the first quarter versus a Russell 2000 Index decline of 1.52%. Many of our positions were beaten down last year and showed signs of recovering this year. You may be shocked to see us adding an energy-exposed position to the portfolio, but Hercules Offshore was the best performing position during the first quarter, almost doubling for most client portfolios. Hercules is an offshore energy services company that restructured last year. We purchased the position when they were trading for less than their net cash on the balance sheet. Barnes & Noble rose over 44% after reporting better than expected earnings. Two of our positions agreed to be acquired. Apollo Education, which we added to the portfolio in January when they were trading for less than net cash, agreed to be purchased by the LBO firm Apollo Group at a 35% premium to our purchase. Rofin-Sinar agreed to a purchase by competitor Coherent for $32.50 per share, boosting our stake by 20% for the quarter. The weakest portfolio position for the quarter was Unisys, falling 30% after announcing a convertible bond issue to raise capital. We sold three positions during the quarter, C&J Energy Services and Daktronics at a loss, and Kaiser Aluminum for a strong gain which exceed the losses by almost 100%. We added three new positions: Apollo Education, Hercules Offshore, and El Pollo Loco. Pollo Loco is a fast casual Mexican restaurant chain with strong expansion potential. Research summaries for the new positions are included. The high yield asset class underperformed in the first quarter, declining 1.74% while the Merrill Convertible Index fell 2.42% and the Merrill High Yield Index rose 3.23%. As mentioned above, the high yield sector was under tremendous pressure beginning in the second half of last year and continuing through early 2016. 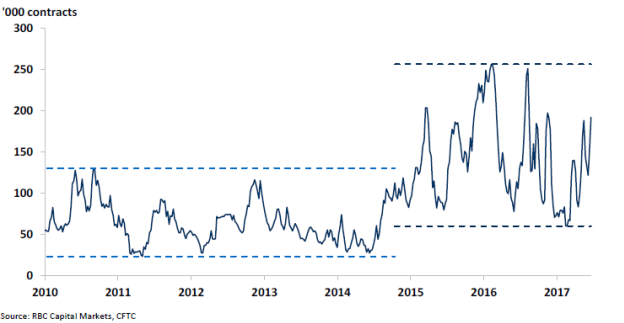 The graph below shows the surge in credit spreads from 500 basis points over Treasuries in early 2015 to more than 900 basis points in January, 2016. In the market environment we just experienced, volatility resulted in more volatility as risk models adjusted. Stock market volatility caused wider credit spreads, which caused fund managers to reduce risk by selling more. This is what we mean by the financial markets potentially causing a recession. Higher volatility led to wider credit spreads, possibly cutting off access to credit for companies that were not performing any worse than prior to the volatility. Fortunately, volatility has subsided following the recent Fed meeting and projections of fewer interest rate increases. The strongest performing position for the portfolio during the first quarter was our AK Steel bonds, rebounding 75%. They benefitted from tighter credit spreads, higher commodity prices and strong auto sales. Navistar’s convertible bonds gained more than 22% for similar reasons. Our weakest position was the Horsehead Holdings convertible bond we discussed last quarter. The drop in zinc prices in combination with multiple start-up problems at their new plant in South Carolina caused the company to file for bankruptcy. They plan to restructure their debt and idle the South Carolina plant until zinc prices improve. We expect to receive equity in the restructured company and zinc prices have already rebounded almost 30% from their lows. We sold our position in Sandridge’s convertible preferred. The company has plenty of liquidity, but when they drew down their credit lines, we viewed that as a sign they planned to file for bankruptcy. We added one new position in Wintrust Financial’s convertible preferred. Wintrust is a Chicago-based bank holding company that was trading at a discount to book value when we purchased the preferred at a yield over 4.60%. The 1st quarter ended significantly higher than the depths reached in the middle of February. The Alerian MLP Index declined nearly 30% from year end on February 11th but ended March down 6.51%, while our portfolio fell 8.32%. This corresponded with many of the same concerns that have hung over the market last year – slow global growth, concerns over China, over supply in oil, the strong US dollar. Sentiment changed as the Federal Reserve softened its resolve to raise interest rates acknowledging the relative strength of the US economy and the US dollar was in effect, tightening for them. News for our portfolio holdings was very limited this quarter and no news is good news. None of our portfolio holdings decreased their distributions this quarter. Most maintained their distributions and a few increased them. M&A activity, growth, and dropdowns were limited across the entire sector for the quarter. MPLX completed a dropdown of inland marine assets from Marathon Petroleum for $600 million and Targa Resources Corp completed its roll up of Targa Resources. We are still awaiting the outcome of the Williams/Energy Transfer Equity merger deal, which looks to be a game of chicken. The Intermediate Bond Portfolio rose 1.45% in the first quarter compared to a 2.07% gain for the Citigroup 1-10 Year Government/Corporate Index. The Intermediate Tax Exempt Bond Portfolio rose 0.79% compared to a 1.10% gain for the Merrill 3-7 Year Insured Muni Index. We are positioned defensively in our bond portfolios, with average maturities shorter than the indices. Surprisingly, even though the Fed increased short term rates in December, longer term interest rates declined. 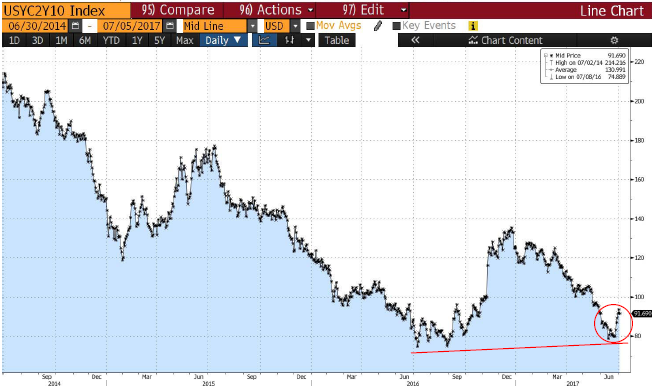 The spread between the two year maturity and the ten year maturity Treasuries fell twenty basis points. Part of this is due to the market volatility. Some is due to weaker than expected economic growth. And some is due to continued extraordinary stimulus efforts from foreign central banks, such as the use of negative interest rates. 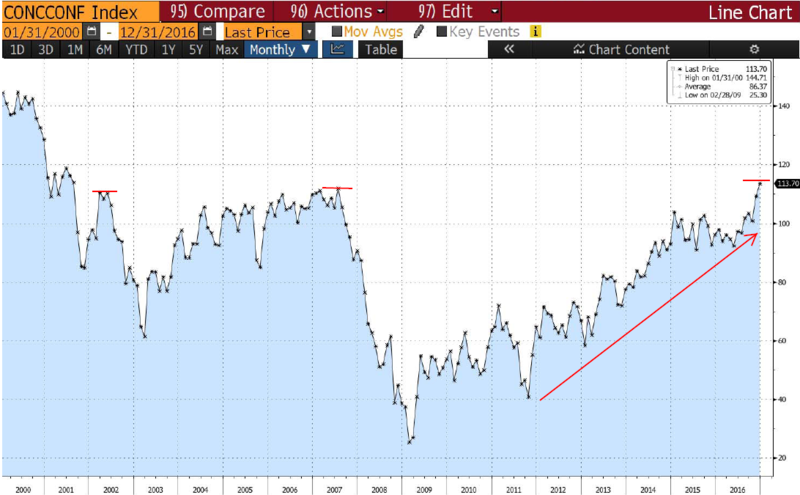 When a ten year German government bond yields less than 0.50%, it makes our ten year note yielding 1.80% look pretty attractive to a global investor. We may not see much upward pressure on longer term domestic interest rates until global growth improves. We are not quite ready to sound the “all clear” but after the last six months, it felt like we have been through a bear market. Fortunately our high quality bonds offered the protection against volatility that they are supposed to. We think risks of a recession have fallen since the Fed has taken a go-slow approach to raising rates. The weaker dollar and stronger commodity prices will boost global economic activity. In springtime, hope springs eternal, especially for Cubs fans.